Set up your workplace exactly as it suits your needs the best. Connect your favourite peripherals to your laptop, tablet, PC or smartphone with new USB-C or Thunderbolt 3 interface. 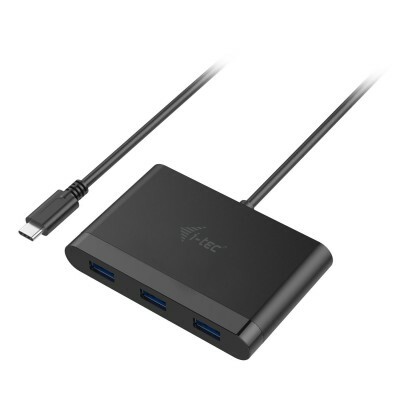 The adapter offers 3x USB 3.0 port for connecting your standard USB 3.1/3.0/2.0 devices and high-speed data transmission (5 Gbps), and NEW 1x USB-C Power Delivery / Data Port for charging laptops, tablets or smartphones with support for Power Delivery. To this port you can connect an original or a universal AC power adapter with USB-C connector, it ensures the constant charging of your laptop, tablet or smartphone during your work. This port also enables data tranfer, therefor can be used to connect modern data devices with USB-C connector (e.g. Ethernet adapter, USB Flash Driveâ€¦). However the port does not enable video tranfer. The adapter is suitable for use with MacBook Pro 2016, MacBook 2015, Chromebook Pixel 2015, Acer Switch Alpha 12, Dell XPS 13, HP EliteBook Folio G1, ASUS UX390UAK and other devices with the USB-C connector. The USB-C connector has many advantages, it is smaller, symmetrical and allows easy connection, because now you donâ€™t have to worry about the rotation of the connector. More information about the USB-C is available here. You will appreciate compact dimensions and low weight of the adapter especially during travels. The drivers are automatically installed from the system when you first connect.